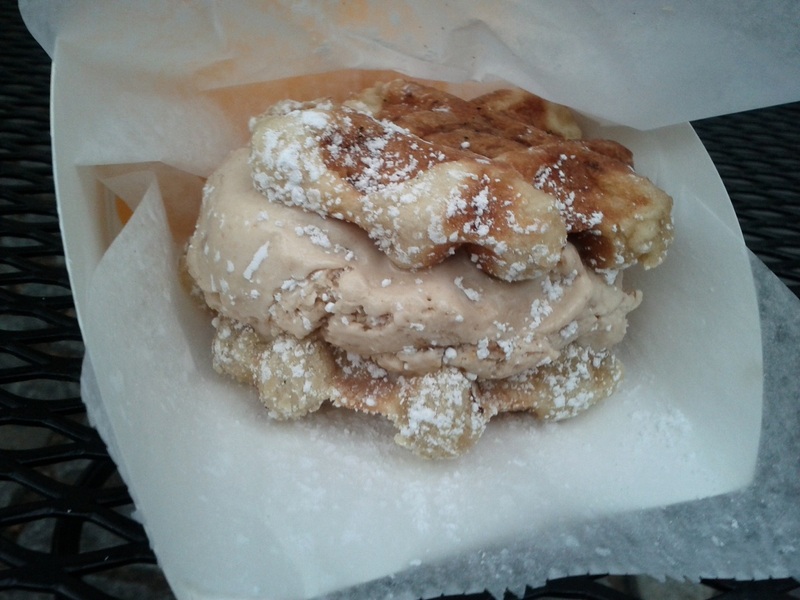 Wafels & Dinges is a chain of carts in New York City, ostensibly putting fourth an authentic Belgian waffle experience. I can’t speak to that, having never been to Belgium, but I can say what they put out is delicious. Warm waffles with a subtle sweetness topped with more directly sweet items, it’s a fine evening snack. Even finer is a treat that comes in the form of a sandwich, as you see above. I don’t think I’ve got more to say about this than that it was delicious, but I should say that several times, and at a less-than-reasonable volume. This was outstanding, with warm crispy waffles and rich, creamy ice cream. This sort of thing is exactly why we eat sandwiches, isn’t it? It need not be fancy, just take the right things, put them together, and you move from good to great. This entry was posted in Sandwich Reviews and tagged Dessert, New York, Reviews by Pete, Sandwiches I Have Eaten, Sandwiches Made For Me by Pete. Bookmark the permalink.